The name is a grand one, the first few shots of the film are a precursor to the film that is going to follow: The American west! The wild frontier! Sprawling landscape, sky that stretches on forever and Indians who can talk only wisdom but wisdom over a bonn fire, while two unknown people gauge on whiskey and beef. 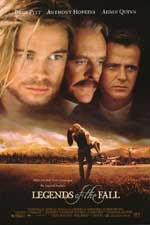 At the center of Susan Shilliday and Bill Wittliff's script are the three Ludlow brothers: Alfred (Aidan Quinn), the oldest and most straight-laced; Tristan (Brad Pitt), the middle child with a special affinity for nature; and Samuel (Henry Thomas), the youngest and most idealistic. The family's patriarch is Col. Ludlow (Anthony Hopkins), an officer who left the U.S. army when he disagreed with the treatment of the Indians. The four men, along with an assortment of friends, live in the Montana Rockies, away from the trappings -- if not the presence -- of civilization. Towards the beginning of the film, two events happen which are destined to turn each of their lives upside down. The first is Samuel's arrival home with new fiancée Susannah (Julia Ormond). Susannah seems delighted with her new beau, until she spots Tristan: unshaven, sweating, caked in dirt, mullet billowing in the wind and almost certainly ponging a fair bit. What woman could resist? The second is the outbreak of the First World War, news of which stirs all three braves into joining the army and heading for Europe to help battle Gerry. Legends of the fall has all the ingredients for a great film, the cast is excellent with the making of a great tragedy with three brothers falling for one girl. The acting although completely unnecessary is over melodramatic, with overly manly hugs, rolling around in the dirt. I particularly disliked the tasteless passage of time shown during Brad Pitt's search for the inner voice in the middle of nowhere where he becomes a "hunter" and in doing so, embarks upon an unknown continent coming back with mementos of an unknown world. This sequence could have been a little creative. The music reminds you of Dances with Wolves and cinematography looking pathetic especially during World War I sequences. Brad Pitt and all the other are brilliant actors but wasted in this film. There are too many clichés' and the film just never seem to end. There are many stages in the film where it looked like it was going to end, but the Indian just went on with the story revolving around Brad Pitt and his search. But after the over melodramatic death of Samuel and Tristan failure to get him back home safe, brings upon the burden of death and dealing with it, makes the film a bit more interesting. The burden of Samuel death plays heavy on both Tristan and Susannah. And this inner conflict is what I found an interesting aspect which pulls the script forward. Only if the disenchantment of Government policies which made their father leaves the army was highlighted more, but although that was not the focus of the film, still the film failed at various stages and the loose script made it worse. My inner voice says, you should avoid the film...and I can see the Indian nodding in agreement with me.